John Constable ranked next to JMW Turner as one the best landscape painters in England. He had the inherent skill in recreating the climate, colors and the unsophisticated and romantic setting of the countryside. He was also distinguished for his contributions to the development of painting en plein air. JMW Turner’s style was clearly interpretive while John Constable was more concentrated on depicting the actual scenes found naturally. His approach was always fresh and spontaneous and his compositions were measured reconstructions that he was able to achieve through his through study of the works of Claude Lorrain, one of the greatest landscape artists during the Baroque Period, and the works of some of the Dutch Realists such as Jan Vermeer, Frans Hals and Rembrandt. 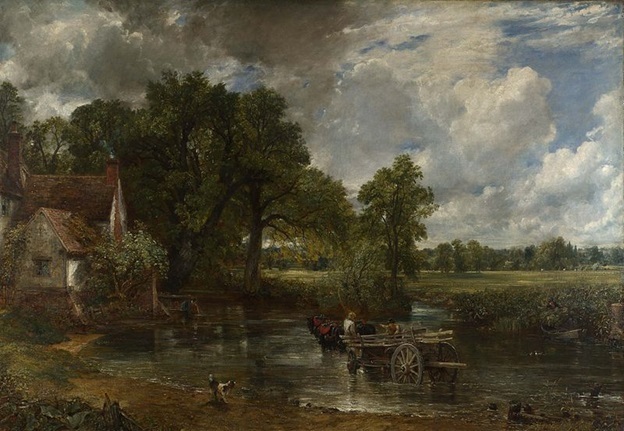 It is ironic that Constable did not have financial success in his lifetime, although his paintings are now among the most valuable and popular art items in Britain. It was very late when he became a member of the establishment, which only happened when he was chosen to be a member of the Royal Academy when he was already 52 years of age. He actually sold more painting in France than in England and was said to provide inspiration to the members of the Barbizon School. 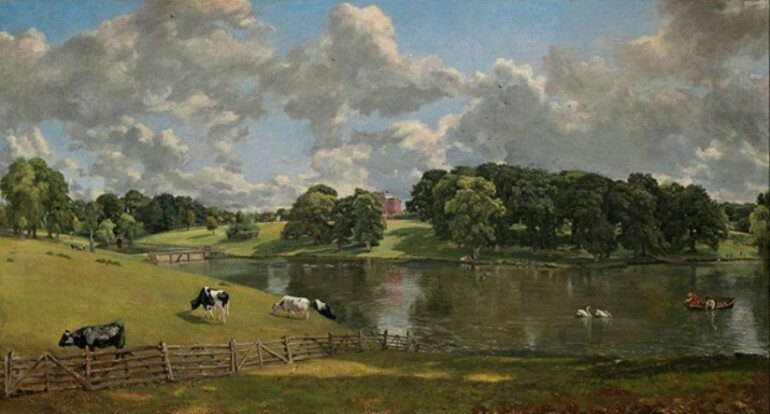 John Constable came from wealthy family. His father owned the Flatford Mill and a small ship that was used for transporting corn from Essex to London. He was expected to succeed his father in the corn business because his older brother was mentally-challenged, thereby forcing him to work in the business after he left school. He embarked on sketching trips in his youth, traveling around Essex and Suffolk. Most of these areas will feature later in a majority of his paintings. He said that the sceneries that he saw made him a painter because he loved the sound of the water and the beauty of the things he saw around, be it brickwork, old posts, rotten wood or trees. Later he met art collector George Beaumont who showed him a Claude Lorrain painting called “Hagar and the Angel.” This painting provided Constable with deep inspiration. He later met a professional artist in Middlesex, John Thomas Smith, who encouraged him to paint but also told him to stay in his father’s business. When he turned 23, he requested his father to allow him to pursue an art career. His father relented and even gave him a small allowance while he entered the Royal Academy Schools, attending anatomical dissections and life classes as well as studied and copied the works of old masters. He particularly drew inspiration from Claude Lorrain, Peter Paul Rubens, Thomas Gainsborough and others. Four years after he entered the Academy, he started exhibiting his works. A year earlier the Great Marlow Military College offered him the position of drawing master, which he refused on the advice of the master of the Royal Academy, Benjamin West, because it would mean that he would not be able to pursue an art career. Many of the features of this mature work such as the freshness of touch, color and light were also found in his earlier works. His compositions though were clearly deeply influenced by Claude Lorrain. He dabbled in portraiture to make ends meet but he thought the exercise dull despite the fact that he also excelled in it. He was not very successful and adept at religious paintings, though. During the summer, he spent the time painting at East Bergholt while during winter, he would stay in London. When he had a chance to visit Salisbury, he was inspired by the city’s surrounding countryside and its cathedral. Many of his wonderful works were depictions of this area. His technique of using small and broken brushstrokes when he wants to show the effects of movement and light when painting en plein air created impressions of light that sparkled around the entire painting. Little did he know that this technique would later become another art movement: Impressionism. He was already 43 years old when he sold a major painting entitled “The White Horse” that later paved the way for more large scale (more than six feet) paintings. One of his famous paintings, “The Hay Wain” was created in 1821. It was exhibited at the Academy and was seen by Théodore Géricault, an influential painter from France. He praised Constable when he went back to Paris, which brought Constable to the attention of art dealer John Arrowsmith, who later bought “The Hay Wain” and four other paintings. “The Hay Wain” won the gold medal when it was exhibited at the prestigious Paris Salon in 1824. He also painted the “Willy Lott’s House from the Stour (The Valley Farm)” that was partly shown in “The Hay Wain” painting.